I’m part of a project that’s going to do some physical rack cleanup. As in, the cables are a mess, labeling isn’t consistent, power distribution isn’t quite what it should be, and it’s gotten to the point where doing maintenance on any of the hardware is tough. So, it’s time to tidy everything up. I’ve been a part of several of these kinds of projects before, and I’ve collected a bunch of data on how to approach it. I thought I’d share here for anyone facing the same challenge. Hopefully, others of you will respond with your own experiences. As you read this, put yourself in the shoes of the project manager responsible to make this cleanup effort a success. Prep is the most important factor in success. Don’t leave anything to the maintenance window that can be done ahead of time, even little things that seem like no big deal. Your maintenance window isn’t very long, no matter how many hours you are given. Build a process so that everyone knows what’s going to happen when as things move along. More detail is better, because it makes you think through the specifics, and you might recognize dependencies you hadn’t thought of before. If there’s any possible way to make rack layouts at multiple sites look the same, do that. The last thing to do before starting to tear things apart is take notes on the status of monitoring systems. What’s up? What’s down? That way, you’ll know what was already broken before starting, so that you’re not trying to chase them down after as if you’d broken something during the maintenance. Get Velcro rolls. Cut strips ahead of time to bundle cables together. “Too much Velcro” is not a viable phrase in the English language. Route cables along the edges of the cabinet to be sure you can always get a server/router/whatever in and out of the rack. I have had the best luck running network cables along one side of the cabinet. Keep fiber optic cables and copper cables in separate bundles. Fiber optic cables are sensitive. It’s wise to minimize physical strain on them. Be careful of cable bend radius. Don’t fold network cables over on themselves trying to neaten them up. You will make the packets cry. If the cable is too long and you can’t replace it with a proper length cable, coil the excess in loops instead. Put power cables and network cables in separate bundles, even if they are right next to each other. That reduces the risk that running a new network cable will impact power and vice-versa. A project like this is a good time to get all-new network cables. If you want to color code network cables (green for storage, blue for app data, etc. ), do that. Personally, I don’t care to color code because the scheme is often impossible to stick with. My personal preference is well-labeled cables that are all one color. Get the network & power cable lengths as close as possible. Gross excess length makes for loops which take up space and block airflow. If you do get new network cables, plan to un-bag and un-twisttie them before the maintenance. It takes a surprising amount of time to do that. Every server, router, firewall, PDU, etc. should be labeled with hostname and ideally the management IP address. If it’s a rack-mounted device, the device should be labeled front AND back so that you can stand on either side of cabinet and know what you’re looking at. This is beneficial for new staff members, and also helpful to keep things straight as more equipment is added to the cabinet. Label each power or network cable on both ends with the same label – what the device is, and what it’s going to. This should all be done ahead of time. It won’t be possible to label the cables as you’re installing them due to time constraints, and it’s unlikely you’ll ever go back to label them. Evenly load balance amp draw across PDUs and phases. Redundant power supplies in a device need to go to different PDUs, assuming the PDUs are fed by different sources. Not sure what PDUs are fed by what power sources? Find out. Remember that amp loads are at peak when everything is powering up. So, don’t push a phase to 80+% utilization for a baseline amp draw. For example, assuming a 20 amp phase, a 16 amp “normal” draw is most likely too much. In a total power failure situation, the breaker will trip when the power comes on and everything on the phase spins up, as it will probably exceed 20 amps. So, if there’s any overloaded phase, a cleanup project is a great time to re-balance. Keep cabinets same-same when possible. Such as, Server1 in Rack1 plugs into the same PDU & outlet as Server2 in Rack2. This doesn’t always work out, but is nice when it can. Predictability is great when you can get it. Consider reserving a specific set of RUs for new systems in a way that preserves the overall rack layout. That might be tough if RUs are tight, but it’s worth a thought. Along those lines, consider what gear you are planning to retire over time. Maybe it makes sense to stick a device scheduled for death at the bottom of the rack, something like that. Someone needs to tell the rest of the crew what’s happening next, and what their roles are. Brains get foggy during middle of the night maintenance windows, and someone needs to know the process exactly to keep the project on time and the tasks moving ahead. All persons involved need to know who that person is. Again, remember that no matter how much time you’ve been given for the window, it will go by quickly. So do everything you can ahead of time. Thoughts to share? Things I missed? Share your tips for success when cleaning up a rack with the community in the comments below. Nice post. I might of missed it in the list above, but if not……label the rack mount and server rails so you don’t waste time later figuring out which piece of equipment the rail belongs to. Yep, great point. Amazing how many rail systems there are. Seems like every box I’ve ever racked has a “unique snowflake” mounting system. I prefer to use cable colors sparingly. The only different color cables I use on my racks are the inbound from the ISP, and outbound from the modem/firewall appliance/router. Everything else gets labelled and is the same color. I have had some success with that sort of a scheme. I tried “red” for public Internet links, “yellow” for DMZ, and blue for everything else. That mostly worked out, but I still had issues with some folks using any color they felt like at a given moment. Throw away the other colored cables? 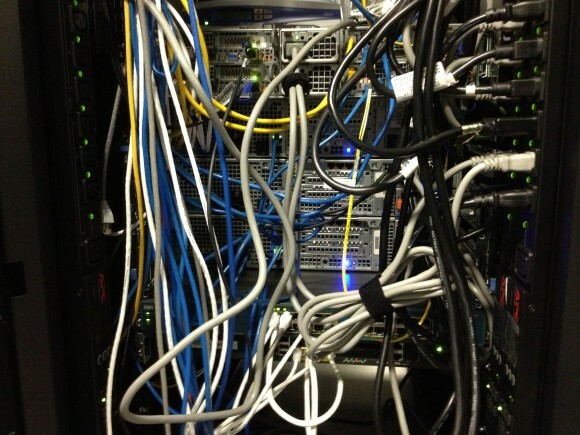 Depending on if you are trying to run strictly CAT6 on your rack, the other cables do not qualify…. Would it be possible to provide an example of a good server – switch port spreadsheet? Sure, I’ll see what I can do about a couple of templates to accompany this blog. One more thing about the power distribution, it’s a life saver to double check your redundant systems that each side of the redundant path matches the power feed. I’ve definitely seen outages caused by mis-cabled A & B feeds of single power supply switches when one feed is lost. Plan to test your redundant paths. Of course I appreciate your idea of keeping things in separate racks – where possible. Does anyone use a DCIM product to help with the rack inventory, like OpenDCIM or RackTables? I’ve seen some very nice DCIM tooling in use, but I’ve always found it very hard to justify the cost. The most reliable has still been the old trusted spreadsheet. Not very fancy, doesn’t integrate well, doesn’t do all sorts of automated stuff, but all those disadvantages have been advantages as well, at some point or another. Great article Ethan! I would love to see an after photo if you can make it happen. Also, would you be able to provide a photo of an example label you would use? I have seen each engineer/company do it differently and I’m still trying to find the sweet spot. Thanks in advance! Great article. I had to do in the last month every weekend a rack cleanup job. Besides the already mentioned points I found very helpful to print out a rack plan on each rack, so that everybody that has to install devices into the rack can see how it should look like. Besides labeling every cable on both ends I add also a unique cable id, which I document in a database. This is extremely helpful when you have patches that a spread over multiple rooms in a building. I use cables that have a optical led on both ends. You can hold a small indicator on one end of the cable so both ends of the cable will start to blink with there led light. This is extremely helpful in my opinion. I do a backup of all configuration that have been changed.